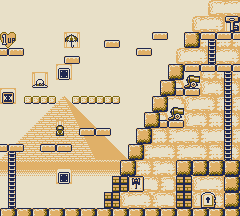 Stage 5-7 is the seventh level in the Desert in the Game Boy version of Donkey Kong. This level introduces Cannons and Arumajiron. Mario starts off on the ground near a Ladder. He must climb the ladder, then make a jump over to the next platform. He must then jump up to the third platform, which has an Arumajiron on it that can push Mario off the platform. Mario must then jump over to some Sand Blocks, which also has another Arumajiron going across. Once on the Sand Blocks, he must activate the Block then put it high enough so Mario can get onto the next platform. Mario can then Handstand Jump to the last three platforms to get to the top. Once at the top, he must climb down a ladder into the pyramid where he must watch out for Cannons which fire Bullet Bill-like objects that can hurt and defeat Mario. After dodging the two Cannons, Mario must go left where he drops down and obtains a Super Hammer which he needs to use to break the Bricks blocking the door and the way out. Once he gets back out, he must head back up to the top of the pyramid by either going up using the platforms or jumping up the sides of the pyramid. After the bricks are broken, he must Handstand Jump up onto the unbroken bricks to get up on them, then continuously jump up the sides of the pyramid until he is at the top again. Mario can then climb a ladder up to the Key used to unlock the door at the bottom of the pyramid. Hat: Above the Sand Blocks. Parasol: On a platform above sand blocks. Bag: On a platform next to the platform with an Arumajiron.